Spoilers and Tolkien geekery abound. 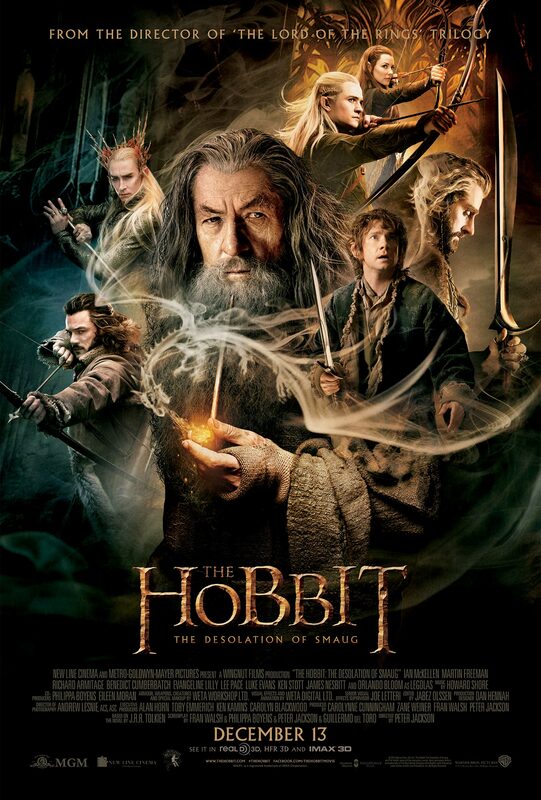 I didn’t exactly fall in love with The Hobbit: An Unexpected Journey. As the first of a trilogy-that-should-not-have-been, it was so obviously padded by both material from the appendices and scenes completely made up by Jackson and the screenwriters. The music was great, the acting was more than many Hollywood movies could ever ask for (I mean, that rendition of “Riddles in the Dark” felt like a coming home to me)–but so much of it was, for want of a better term, fanfiction. And they were so obviously feeling their way around–I’d never complained about the length of a movie before Journey. So I wasn’t going into The Desolation of Smaug with very high hopes. And then I read my cousin Nico Parungo’s review, then edited Misha Lecaros’s review of it. The former had never read the books and the latter had. Two good reviews from entirely different viewpoints had to mean something, right? This second installation of The Hobbit trilogy picks up (almost) right where the previous movie left off. The Company is already halfway or more to the Lonely Mountain, though they have to get through a shapeshifter, a relentless troop of Orcs, a kingdom of haughty Elves, and men both sleazy and honorable first–and between all that, crazy barrel rides, spider attacks, Gandalf disappearing on a secret mission, a looming threat in Dol Guldur, poisoned arrows, and Elves both smitten and jealous. And when they do finally get to the mountain, they find that the dragon Smaug is more than what they bargained for. Okay. I still don’t agree with resurrecting an Orc who should have died during the great war of Dwarves and Orcs (die, Pale Orc, die), but I’ve long accepted that a movie adaptation of a book is a completely different animal from the book itself. Rare are the movies that follow their source books faithfully, and even with those, a few visual liberties needed to be taken in order to fit the medium (I’m looking at you, Catching Fire and the first two Harry Potter movies). And considering that one, The Hobbit is a slimmer book than any of the Lord of the Rings books and two, this is the closest all us Silmarillion and Unfinished Tales fans are gonna get to a screen version of the aforementioned books, it’s totally understandable that material from the LOTR appendices were added for the fleshing out of the storyline. The difference between Journey and Desolation is that the former is like Bilbo using Sting for the first time in the Misty Mountains and the latter is more like Aragorn wielding Anduril on any occasion. Indeed, it seems that Jackson, the cast, and the crew are all treading with surer footing. The pacing is just right, the dialogue not as useless (Fili: “If there is a key, there must be a door!”–straight out of Legolas a.k.a. Captain Obvious’s book), the action scenes are more fun than tedious–only Peter Jackson will think of slaying Orcs while jumping barrels–and plotlines both canon and Jackson-made are more deftly woven together (I mean, I don’t feel so bad about watching Azog strut his stuff onscreen even though he should, by all rights, be dead). The humor has also gotten a whole lot less slapstick (though there’s still plenty of that to go around) and a whole lot wittier. From a double entendre between Kili and Captain of the Mirkwood Guard Tauriel to Legolas insulting the Dwarf Gloin’s family (which, incidentally, includes his future best friend Gimli), we’re definitely looking at a more put-together script, whether the jokes are to your taste or not. There is, thankfully, less of Radaghast’s antics (and by association, way less bird poop). There is a romance now, too. I wasn’t going to like Kili and Tauriel at first, though interviews between Journey and Desolation alerted me to their existence. I thought Tauriel would have been better suited to Legolas, and besides, every flirtatious scene between the hot Dwarf and the beautiful badass Elf made my sister and I stick out our clawed hands in silent OH GOD WHY WHY WHY. But then, the chemistry between Aidan Turner and Evangeline Lilly was so palpable and I am, for some reason, a goner when it comes to sappy lines uttered in some elevated form of English, so there it is. I am trying very hard not to like them as both a couple and as individuals, considering how I feel that this will only end in tears, but I am failing miserably. And I guess it adds more tonal variety in an already action-packed film. Things start to get a little more serious as well, beginning from when Kili takes a poisoned arrow to the leg. I didn’t realize it until I watched him stagger from the pain, but it was rather unsettling that all 13 dwarves of the Company (plus Bilbo and Gandalf) escaped any serious injuries this far into the trilogy when Frodo almost dies of jab from a Morgul blade in the first third of The Fellowship of the Ring. I also liked Gandalf’s scenes in both the tomb of the Ringwraiths and in Dol Guldur–here we have a 7,000-year-old Wizard, more powerful than most creatures on the face of Middle Earth, and yet, he can still be thrown back by a bunch of Orcs. Somehow, showing that they’re not all invincible takes away a little more of the cartoon-y, picaresque caricature quality of 14 tiny beings and a wizard on a quest to reclaim gold from a dragon. They are made more human this way, even though none of them really are. Kudos to the acting chops of Martin Freeman (Bilbo) and Richard Armitage (Thorin). With simple gestures and deceptively simply facial expressions, both of them convey the sense of falling into corruption: the former due to the Ring and the latter due to Dwarf greed. Thing is, considering how this is going to tie into LOTR, we all know who’s going to fall faster. Luke Evans (Bard), Evangeline Lilly, and of course, Orlando Bloom, are welcome additions to the cast. Thing is, Lilly seems to have a default face, whether she’s being interrogated by Thranduil (Lee Pace) or saving Kili from a poisoned arrow. Orlando Bloom has gotten visibly older, and not to mention, is playing a very different sort of Legolas this time around. His nose actually bleeds and his hair becomes a mess! I both dread and can’t wait to see the incident that will turn him into the smooth-haired, marble-faced Legolas we all know and love from the LOTR trilogy. And lastly, a word about the music. Howard Shore never fails to deliver with his wonderful orchestral compositions–I just can’t remember that particular scene when the violins really stood out, it might have been when Bard was sneaking the Dwarves into Lake Town. But it was Ed Sheeran’s “I See Fire” that really stole my heart this time. I already wish it were December 2014, even though I know I’m prolly gonna have to dole out the tissue alongside the popcorn.